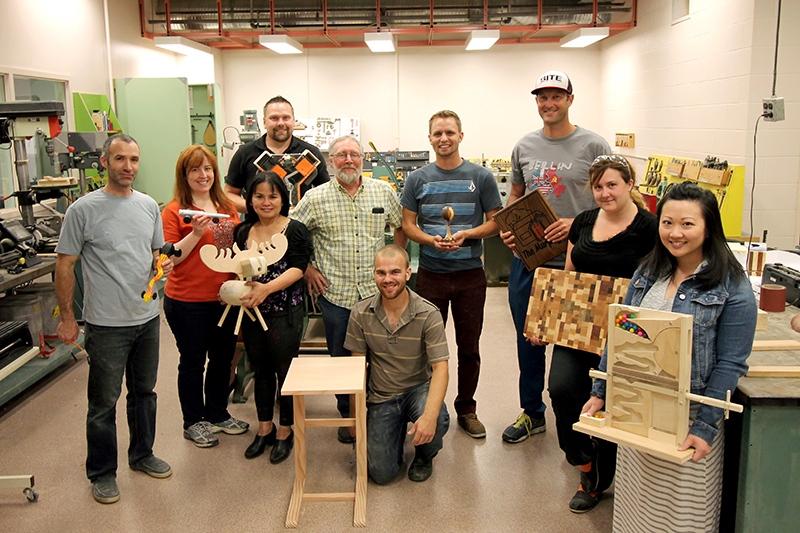 When asked to bring their favourite projects for the group photo, instructor Don McPherson said that all the students were his favourite project. This summer a group of future and current Career and Technology Foundations teachers honed their skills in the workshop. The course, taught by Don McPherson, gave students hands-on experience in developing projects they could take back to their classrooms. From making end tables to gumball machines, this was a new experience for some. “I’ve never touched any construction or woodwork, so this is a lot of firsts for me, but I’m having lots of fun and making a lot of cool things” said Jamie Lambert-Brown, a foods teacher. “I’ve learned how to make meaningful learning opportunities,” said Ryan Siemens, a future mechanics teacher. Check out the photo gallery below to see more of the students’ work.